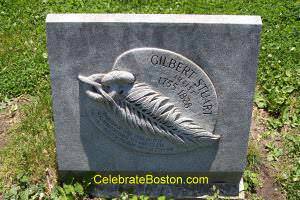 Gilbert Stuart (1755-1828), American artist and portrait painter, is buried at Central Burying Ground. Stuart's remains are in tomb #61, and a marker was placed on the Boston Common side of the grounds in 1897. Gilbert Stuart painted Presidents George Washington, John Adams, Thomas Jefferson, and James Madison. He also painted Kings George III and IV of England, and King Louis XVI of France. He completed more than 1000 works in total during his life. Stuart's most famous work is the1796 unfinished portrait of George Washington. It was used for Washington's likeness on the United States $1 bill. This work is jointly owned by the Museum of Fine Arts and the National Portrait Gallery. Gilbert Stuart painted George Washington many times. A famous work of President Washington, located in the White House, has an interesting story. During the War of 1812, between Great Britain and the United States, British General Ross captured Washington and set fire to much of the city. This scorched-earth policy was in retaliation for the Americans previously burning the parliament building at York Canada. President James Madison collected his generals and organized his troops on the outskirts of Washington, and could see the city burning. 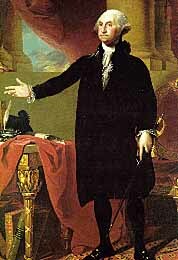 Dolley Madison, the First Lady, at great risk to herself, ordered that the Gilbert Stuart painting of George Washington be broken from its frame and safely removed from the city. She rescued a great national treasure. After capturing the White House, General Ross mocked the President and then plundered the building before setting it ablaze. "The lovers of the art of painting have sustained a great, if not an irreparable loss in the death of the celebrated GILBERT STUART. By the decision of Mr. West, by the common consent of the best judges on both sides of the Atlantic, Mr. Stuart has been pointed out as the first historical portrait painter in the world. In painting the portraits of private individuals, he is admitted to have had no equal. Those who had felt their pride gratified in numbering such a man among their countrymen, will pay to his memory a tribute of a grateful and affectionate regard. It is not those who are proud of the genius of Mr. Stuart, alone, that regret will be for his decease. Though his labors have such as to secure him an immortality of fame, he has yet found time to attach himself by the graces of his conversation and the vivacity of his wit, great numbers of his fellow citizens, as well as very many individuals, in the various societies where it has been fortune, at different periods to reside. Upon the grief of his bereaved family we will not presume to intrude, so far even as to offer sympathy or condolence. The estimation in which the great artist is held by his countrymen, the name he has left, and the works he has achieved, the reputation which he was associated with the image of Washington, and rendered coeternal with the recollection of many of the most distinguished advocates of our independence, will console them when the first burst of their grief shall be over, and soften, after a time, the anguish of bereavement."